John Terry was a guest pundit for Sky Sports on Sunday as he watched Chelsea suffer defeat to Man City in the League Cup final at Wembley. Maurizio Sarri’s side eventually lost out on penalties, but the encounter didn’t pass without controversy towards the end of extra-time. Blues goalkeeper Kepa Arrizabalaga appeared to be struggling with cramp, and as Willy Caballero was waiting to come on to replace him for the shoot-out, the Spaniard ultimately refused to come off and went on to complete the game. Sarri was seen incensed on the sidelines, screaming towards his goalkeeper as well as towards the bench, as the Chelsea boss seemingly saw his authority ignored by the Spaniard. 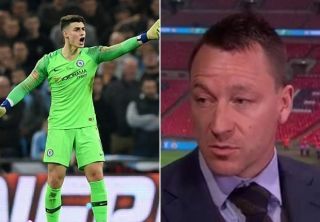 While the pair have since come out and insisted it was merely a breakdown in communication over Kepa’s recovery from cramp rather than taking the decision into his own hands, Terry has had his say on the matter and believes it really doesn’t help an already under-pressure Sarri. “It leaves Sarri in a tough place – I’m surprised he didn’t force him to come off,” he told Sky Sports. “It will be interesting how it pans out in the next 24 hours for the club. “It’s not the end of it – it’s a cloud over a really good Chelsea performance especially with what’s happened of late. “If I was in there [dressing room] I’d be expecting the manager to come in and deal with it instantly. The Spurs game on Wednesday is a massive game for the football club – what it means for the supporters and the players. Time will tell if the pair were merely putting on a united front for the media and fans, or if this situation now rumbles on through the week. Dropping Kepa against Tottenham would be a major indication that the matter isn’t finished, as given Sarri was still furious as the teams prepared for the shoot-out, that would surely suggest that he wanted to make a tactical change but was ignored by his own player.